Details have emerged of further violent incidents at a privately-run prison where a serious disturbance took place on Sunday. In the latest incident, a group of prisoners at HMP Oakwood, near Wolverhampton, reportedly refused to be locked-down. There was also a series of assaults and an outbreak of violence at the prison two months ago, according to documents seen by the BBC. at Oakwood at the weekend was the tip of the iceberg. where prisoners or prison staff were assaulted. that is veering on being out of control. Operator G4S declined to comment. The documents, from the National Offender Management Service, reveal that staff in riot gear were deployed to a disturbance in November. About 18 prisoners, most of whom were said to be drunk and armed with pool cues, threatened prison officers and lit small paper fires. The following week, there were five outbreaks of violence in which staff or prisoners were attacked. On Sunday, inmates allegedly barricaded the entrance to the Cedar Wing and smashed windows. The disturbance, which G4S said involved between 15 and 20 prisoners, was brought under control in nine hours without injury to any prison officers. The BBC was told up to 50 prisoners were involved. A investigation by prison officials and the police is now under way. 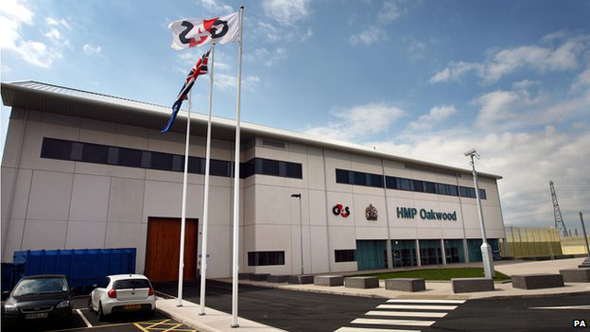 HMP Oakwood, which houses more than 1,600 category C prisoners, was criticised by inspectors during a surprise visit last year. G4S, which has been running the jail since it became privately run in April 2012, declined to comment on the leaked documents. But a spokesman said private sector prisons were subject to strict requirements when it came to reporting incidents to senior officials. Earlier, the company said the prison was "still in its start-up phase" but it had ambitions to make Oakwood "the best prison in the world".